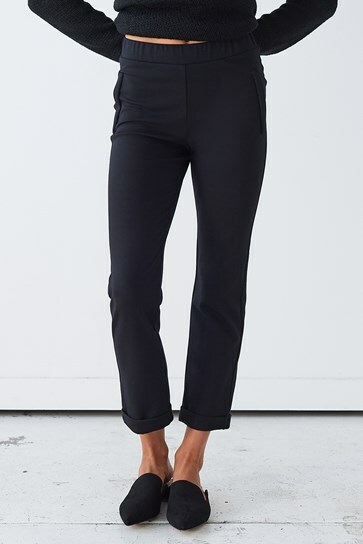 Softness and simplicity come together to create the ultimate Ponti pant. Full length with wide elastic waistband. Shaped pannelling for the perfect fit. Heavy weight stretch Ponti fabric. Rayon Nylon Spandex mix..Cool gentle wash. Wash separately first wash. DO NOT bleach, soak, wring or tumble dry. Cool iron on reverse side using iron cloth. Line dry in shade. Drycleanable. Exposure to rubbing or rough surfaces may cause pilling..